Each year, 100 families will find out that their child has hepatoblastoma, a rare childhood cancer. Children’s Cancer Research Fund Chief Medical Advisor Logan Spector believes that even when a cancer is rare, help shouldn’t be. Hepatoblastoma is one of the fastest rising childhood cancers in the U.S., yet it’s still considered one of the rarest. It’s so rare, in fact, that researchers like Spector struggle to find public funding to study the disease. “Although hepatoblastoma research is very important to the families affected by it, sometimes NIH reviewers just do not see the need to study such a rare cancer,” Spector. This lack of funding means that kids like Joey have to endure out-of-date treatments that can cause long-term side effects such as hearing loss, heart problems and even secondary cancer. 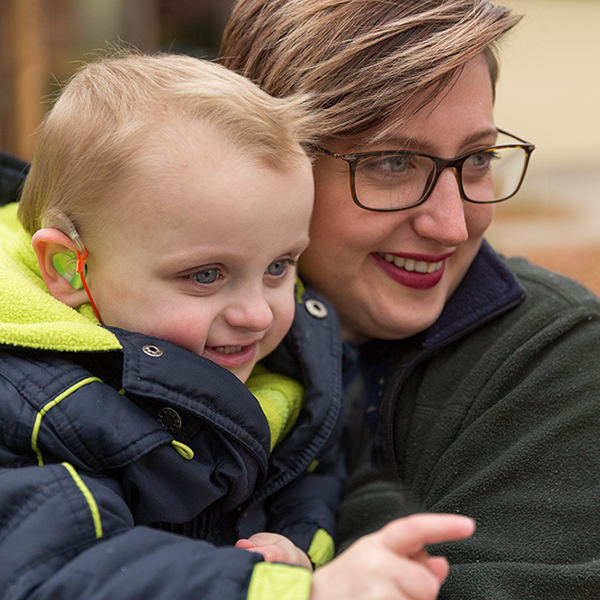 Because of side effects from his chemotherapy, Joey now wears hearing aids and leg braces. His cancer and the effects of treatment have changed day-to-day life for Joey and his family – he now takes multiple medicines every day, including one that his mom says tastes like lighter fluid. Treatments for hepatoblastoma have barely improved in decades, but that doesn’t mean they can’t. Five years ago, donors like you began putting their focus and generosity behind research on osteosarcoma, another rare cancer. In those five years, researchers made 15 new discoveries and began a promising clinical trial. Spector’s work gathering DNA for a biobank to study hepatoblastoma could be the beginning of the next big breakthrough, but only with generous, ongoing support. If we put that amount of effort behind hepatoblastoma research, imagine what we could do in another five years for children like Joey. Learn more about hepatoblastoma by reading about Logan Spector’s research or reading Joey’s story.